We don’t use any animal material to make our products. As an ethical commitment, for the animals, but also for the environment. We easily replace leather with eco-friendly materials. How to replace leather ? To replace leather, big grands usually choose PVC. But this choice has a negative environmental impact. Indeed, and though it is made from more than 50% mineral salt, the making of PVC emits a toxic chlorine and releases dioxines. In addition to that, plasticizers are often added, among which some nocive phtalates. Why use it to make vegan bags when we also know that PVC has a strong plastic smell ? The other option is to replace leather with PU (Polyurethane). If the making of PU isn’t yet perfect, it is largely less harmful than that of PVC. It doesn’t contain chlorine. And it doesn’t smell plastic. That is the solution we chose for our Diana pouches and our Cassie bags. It is even better, as the material we chose is a microfiber containing mostly cotton (55%) and PU is only 45%. Our environmental conscience pushes us to always look further ! 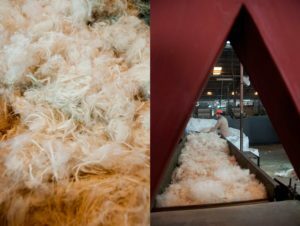 Though the microfiber we chose is the best we found, we know the cotton’s impact on the environment. So we are trying to replace it with a material made from recycled apple peelings ! Among all the eco-friendly materials, our favorite is Piñatex®, the famous material made from recycled pineapple leaf fibers. Indeed, it is a by-product of the pineapple production and does not require any additional environmental ressources. Furthermore, the production is made in a closed loop : residual leaf biomass is used as natural fertilizer/biofuel. And, the non woven mesh is biodegradable. So, although the leaves come from the Philippines, the impact of that transport is completely compensated. We are proud to have been among the first European brands (and the first in France!) to have used it. You may wonder how a material that looks like leather is made from pineapples. Here is the answer, with pictures ! Piñatex® is made by recycling the leaves from the pineapple tree, on which grows pineapple fruits. Every year in the world, there are 13 million tonne of waste from global pineapple agriculture. Once the leaves have been harvested, they are gathered for triage – instead of being thrown or burnt. The making of Piñatex® creates an additional stream of income to pineapple farmers. The leaves are then decorticated to extract the fibers. The leftover biomass is retained to be used as a natural fertiliser or biofuel, offering a further economic prospect. 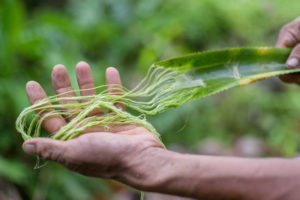 Pineapple leaf fibers dry before their transformation. 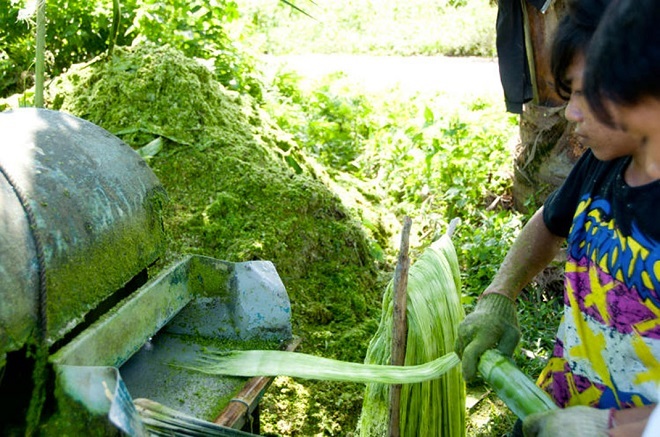 480 pineapple leaves are needed to make 1 square meter of Piñatex®. Last step, the fibers are transformed in Spain to give them their oh so particular texture. Find all our products made with Piñatex® !